This year the Institute informed and influenced the debate on a host of policy issues related to tax policy, child care, and health care. Here is a summary of several policy changes that will have an impact on the fiscal health of Rhode Island and its residents. Click here to download the document. 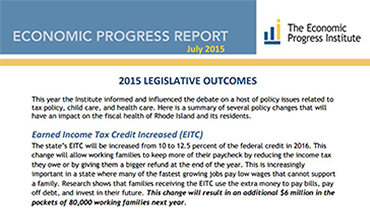 The state’s EITC will be increased from 10 to 12.5 percent of the federal credit in 2016. This change will allow working families to keep more of their paycheck by reducing the income tax they owe or by giving them a bigger refund at the end of the year. This is increasingly important in a state where many of the fastest growing jobs pay low wages that cannot support a family. Research shows that families receiving the EITC use the extra money to pay bills, pay off debt, and invest in their future. This change will result in an additional $6 million in the pockets of 80,000 working families next year. Two improvements were made to the Child Care Assistance Program (CCAP), which provides subsidies to parents to help pay for early learning programs for their young children and for safe after-school care. Lawmakers made permanent a pilot program that allows income eligible, unemployed parents to use subsidized child care during time spent in short-term job training programs. Previously only parents working 20 hours a week or more could access CCAP.This will result in at least an additional $200,000 investment in child care assistance for families. Lawmakers also approved a small (3 percent) increase in payment rates to child care providers (both centers and licensed family providers) that provide child care for families participating in CCAP. This increase is a step in the right direction in supporting child care workers who provide important child care and early learning services to over 8,900 young Rhode Islanders. These workers have not received an increase in payment rates from the state in the last seven years despite increased demands to provide higher quality programs. This will increase payments to providers by $2.15 million. The minimum wage was increased from $9.00 to $9.60 an hour beginning in January 2016. This is the fourth year in a row lawmakers enacted an increase, which will directly impact approximately 48,000 workers in our state. This would increase the pay of someone working 35 hours per week by close to $730 a year. Governor Raimondo convened the “Reinvent Medicaid Task Force” and charged it with proposing ways to reduce general revenue spending on Medicaid by $90 million. The enacted Budget includes over 30 initiatives that are expected to save approximately $60 million in general revenue in the coming year. Including the federal match, the Medicaid budget will be reduced by $112 million, or about 4 percent overall. Approximately half of the savings are from reductions in payments to providers or for services. Hospitals and nursing facilities, which experienced the largest cut in payment, will be able to earn back the lost revenue through incentive programs if they meet certain quality and service targets yet to be defined. The balance of the anticipated spending reduction is realized from savings from improving care coordination, increasing access to community-based services for people with disabilities, and seniors and program integrity improvements. The Budget authorizes the Department of Administration to establish Health Source RI (HSRI), the state’s health benefits exchange, replacing the Executive Order under which HSRI had been operating. Funding for HSRI comes from an assessment on insurers and must mirror the assessment that would be required if the state allowed the federal government to operate the exchange. For the coming fiscal year there is a general revenue appropriation of $2.6 million to support the transition. The director of the department of administration is required to appoint an advisory board with members that reflect a range and diversity of skills, backgrounds and stakeholder perspectives. The budget included a host of new economic development incentives that will initially be paid for with proceeds from refinancing and restructuring some of the state’s debt. These incentives include several tax credits aimed at spurring real estate development, stabilizing tax payments for new development, and job creation incentives. Initially these incentives included little in the way of public disclosure but the final budget built in many of the disclosure and reporting requirements that have been put in place in recent years.This will help taxpayers know how much revenue is being given to companies and what the state is getting in return.